Our colorful beach shack serves an inventive and delicious blend of all the caribbean flavours. Dine in our garden patio or call in for take out. We also cater Holiday parties and all events. We are located on the corner of Pico and Ocean Blvd. a couple blocks south of the Santa Monica pier, and within walking distance from hotels; Casa Del Mar, Shutters on the beach, and Viceroy. 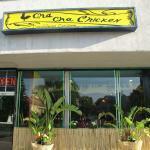 Come and experience the best in eclectic Caribbean cuisine at affordable prices. We look forward to see you at Cha Cha Chicken. Running late for lunch ???. Just call or fax us your order and we will have it ready for you.